Let’s take a moment to talk about wrestling once again. 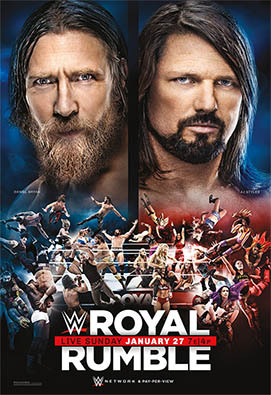 This time, it’s the 2019 edition of WWE’s Royal Rumble, the first of WWE’s “big four pay-per-views” in the calendar year and probably WWE’s most loved PPV aside from Wrestlemania. Now, if you include the pre-show, this Royal Rumble went on for nearly seven hours, I’m going to try and keep my synopsis as short as possible. And I’m skipping the pre-show bits. Now let’s get started. Becky Lynch vs. Asuka (C) for the Smackdown Women’s Championship. The pay-per-view proper started off with a bang, as Becky Lynch challenged Asuka for the Smackdown Women’s Championship in a great match. Surprisingly, Asuka won completely clean by making Becky Lynch tap out, but they found a way to end the show making both women look strong, and it was such a strong match that Becky still looked strong in defeat. This match was…okay. Everyone involved pulled off some strangely stiff shots on each other, and Shane McMahon got some time to do his usual ‘he’s-too-old-to-be-doing-that-kind-of-thing’ top-rope stuff, including ending the match with a Shooting Star Press for the win and the tag team titles. This match should have been better than it was. Not bad, but with how much progress Ronda Rousey has made in her year as a wrestler, and how good Sasha Banks always has been, it was a bit clunky. Rousey retained of course, and I don’t see her losing the title (or a match) until Wrestlemania. This felt like the proper Royal Rumble of the night, and should have gone on last. Not a whole lot of surprise entrants, but we had the ironwoman of the match (Natalya Neidhart), the blink and you’ll miss it entrant (Liv Morgan), and all that jazz. It wasn’t anything too special, until Becky Lynch interrupted the entrance of an injured Lana, took her spot in the match (which makes no sense, but don’t worry about it), and went on to win the Rumble despite being beaten and battered after her war with Asuka. Great finish that, again, probably should have closed the night. As expected for two wrestlers of this world class caliber, the in-ring action was stellar. The ending, on the other hand… kind of random. 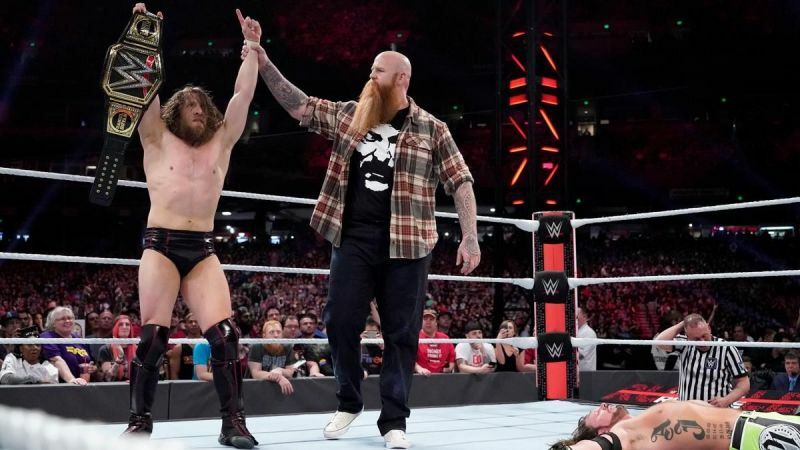 Erick Rowan (AKA the guy who was one half of a tag team whose gimmick was carrying around giant mallets for all of last year) made his return, and conveniently showed up about a minute before the referee got knocked out, gave AJ Styles a choke slam, and helped Daniel Bryan retain the title. Because reasons. This was just an utterly random ending. And if this were the route they were going with, couldn’t Rowan have entered the fray sooner? I get that it’s a show, but having the guy who’s bound to interfere enter the scene mere seconds before he’s supposed to do his thing kind of crushes the suspension of disbelief. Look, I get it. WWE has some bizarre infatuation with Brock Lesnar, despite the fact that his “special attraction” aura disintegrated years ago now. I knew Finn Balor wasn’t winning this. And to their credit, WWE did give Balor a lot of really good offense. So he almost looked good in defeat. I say ‘almost’ because WWE decided to give the match a crap finish by making Finn Balor tap out after a less-than ten minute match. Okay, I get that the show was obnoxiously long already, but was this really the match to trim down? And making Balor tap out kind of undermined the whole “David vs. Goliath” story they were going for. Couldn’t they have made him pass out from taking too much punishment and refusing to give up or something? You know, an ending that would play into his heroism, even in defeat. And what about after the match? Balor just got destroyed by Lesnar some more! What was the point? Who benefits from this? I mean, other than Vince McMahon and his fetish for overplayed acts? This was decent, but not as good as the Women’s Rumble. Seth Rollins won, of course. Narratively speaking, they haven’t built up anyone else who could have won (unless they did for Finn Balor what they did for Becky Lynch). So it was a pretty obvious conclusion, but at least they didn’t show a video package ahead of the show that more or less screamed who the winner would be like they did with Randy Orton in 2009. The only real noteworthy story was that Nia Jax, after having been eliminated in the Women’s Rumble, beat up R-Truth during his entrance and took his place (again, don’t think about it too hard). She managed to eliminate Mustafa Ali, before taking a super kick from Dolph Ziggler, 619 from Rey Mysterio, and an RKO from Randy Orton before being tossed out (you would think she would have eliminated more people if WWE went through the trouble of adding this mini-narrative…but again, we’re talking about the company who still thinks the idea of Brock Lesnar as champion warrants a shred of interest). Overall, it was an okay show. The Royal Rumble matches are always fun to watch as they happen, but after the fact you can think about how well everything played out. And well, the Rumble winners were expected but deserving, and the in-ring work of every match was solid. But the ending to Daniel Bryan/AJ Styles (a match that needed no screwy finish), and especially the ending of Lesnar/Balor really dampened the show. And with a five-is hour main card, and a total of seven hours including the pre-show, and the 2019 Royal Rumble was another example of a modern WWE pay-per-view being waaay too long. The only other noteworthy bit to take away from the show is that Kacy Catanzaro and Naomi out-Kofi Kingston Kofi Kingston. That is to say, Catanzaro and Naomi saved themselves from elimination in their Rumble match in more creative (and believable) fashion than Kofi Kingston did. 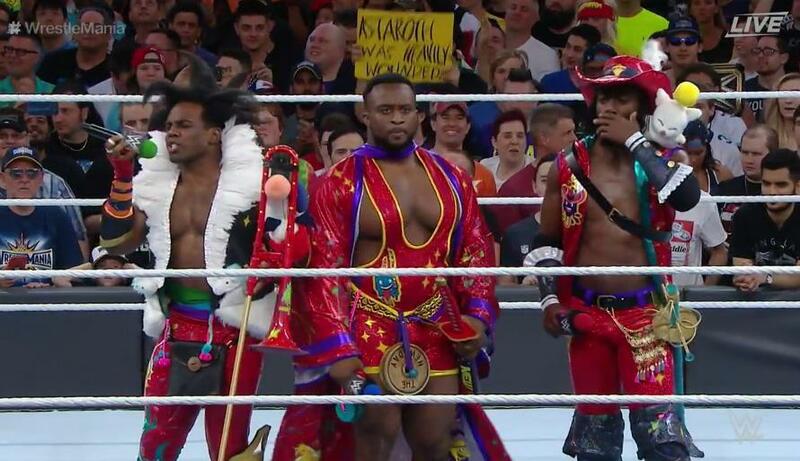 I always enjoy the Kofi Kingston spots we get to see every year during the Royal Rumble, but this year Kofi did two, both of which seemed derivative of previous spots from yesteryear, and both of which I swear both of his feet hit the ground anyway. An okay show, and hopefully Seth Rollins and Becky Lynch’s victories mean things will pick up from here. And here’s hoping that something will actually come out of Finn Balor’s loss, instead of him just being another unnecessary burial to Lesnar. Far from the best Rumble (I don’t think it was nearly as entertaining as last year’s edition), but not the worst either (that would be 2015). Let’s do something a little different and talk about wrestling! Granted, I’m predominantly a video games and movies man, and this is a predominantly video games and movies site, so who knows how many of my readers will actually give a care. But oh well, I like wrestling, WrestleMania is the biggest wrestling event of the year, so I’m going to write about it. I haven’t talked about wrestling much here at the Dojo (save for my WWE awards as part of my Christmas blogs, and of course when reviewing wrestling-based video games), but due to the ending of WrestleMania 33, I just had to write a little something. So let’s give this a shot.